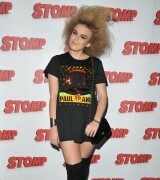 Tallia Storm (born Natalya Storm Hartmann in 30-10-1998) is a Scottish R&B / soul singer, originally from Glasgow. At the age of 13, Storm was "discovered" by Elton John who invited her to open his concert in Falkirk. By the age of 16, she had performed at several events, received a recording contract, signed a book deal and started writing a blog. Tallia Storm is the daughter of Tessa Hartmann (owner of a PR agency) and Sascha Hartmann, a film director. She attended The High School of Glasgow Junior School and later Senior school.After leaving the school in 2013, Storm attended Balfron High School. The Hartmann family was on holiday when thirteen-year-old Storm had a chance encounter and brief conversation with David Furnish. She gave him a copy of her CD with a letter of introduction addressed to his partner, Sir Elton John. The following day Sir Elton called and invited her to open his gig in Falkirk. On 10 June 2012, she sang a 25-minute set of five songs before a crowd of 15,000.A Scottish newspaper dubbed her the ‘Tiny Chancer’. The Elton John concert led to Storm's performances at a number of events and radio road shows in the UK, including Capital FM and Radio Clyde's live road shows. In September 2011, Storm performed during Bunmi Koko's catwalk show at London Fashion Week.On 11 June, she performed at the 2012 Scottish Fashion Awards, an annual event organised by Tessa Hartmann.Storm has also supported Jeans for Genes by performing at charity events. Storm was a host and performer at the 2013 and 2014 TEDxTeen events. In June 2014, she was signed by Ron Fair of Capitol Music Group / Virgin Records, and secured a global recording agreement. On 14 May 2015, Storm performed with Tinie Tempah at the MTV Staying Alive Foundation ‘Found’ event in London. In July, she performed at the 2015 'Big Gig in the Park' charity event in Jersey where she was interviewed by the BBC's Ryan Morrison. In December, the Daily Record announced that Storm's debut album would be released in 2015.Her first single was entitled "Social Security" and was released on 10 May 2015. In October, 2014, Paul Frank announced that Storm would be starring in the brand's UK 'Pajammin' campaign. As the brand ambassador, she recorded an acoustic version of her track "California" which she would perform at various live events. In May 2015, Chupa Chups announced Storm was the face of its AirHeads candy being launched in the UK.The campaign, which featured Storm's hair in AirHead colours, ran in 130 newspapers in the United Kingdom. Storm began writing a blog for Huffington Post in 2012. In 2014, Storm was offered a two-book deal with children’s book publisher, Scholastic with the books scheduled to be released in September, 2015.